Keep your roof top-of-mind, and call Grand Valley Roofing & Coatings Inc. located in Cambridge for your roofing system needs. From residential roofs to industrial, commercial, or institutional roofs, we offer roofing services such as installation, repair, and maintenance with top-quality materials from name brands such as IKO, Soprema, and Velux. We also offer snow removal for your roof, 24/7 flat roof emergency response for leaks or blow-offs, masonry services, and much more. We serve the Southern Ontario area. When you call us for a free estimate, we will come to your site and thoroughly inspect the roofing system on your structure to give a proper report of the problem, along with a competitive quote. 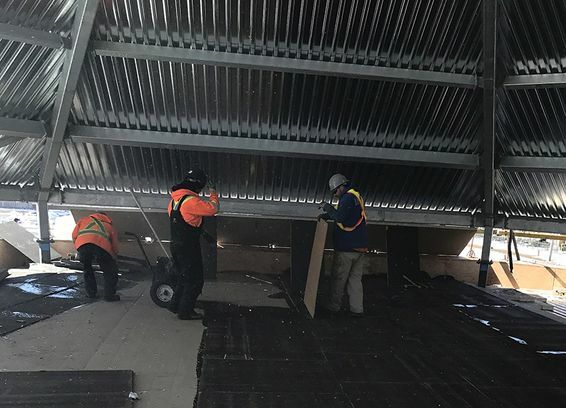 From modified bitumen roofs to shingled systems, Grand Valley Roofing & Coatings Inc. has over 30 years of experience in the industry to handle any roofing problem you may have. Grand Valley Roofing & Coatings Inc. is committed to respecting the privacy of individuals and recognizes a need for the appropriate management and protection of any personal information that you agree to provide to us. We will not share your information with any third party outside of our organization, other than as necessary to fulfill your request. Do you like working outdoors? Do you see yourself working as part of a team? Do you want an above-average income? Are you looking for long-term employment with one of the best roofing companies in the area? Do you like the feeling of accomplishment at the end of the day? If you answered yes to the above questions, then we’re looking for you. No experience? No problem. We will provide you with all the necessary flat-roof training. All you have to provide is a positive attitude, willingness to learn, a commitment to working hard and the drive to show up ready to work each day. Come in and drop off your resume or fill out the Contact Us/Career Opportunity form below and email your resume to gvroofing@grandvalleyservices.ca.